I’m talking today about publishing your book digitally on Amazon KDP direct publishing. I’ll be talking mainly about the fiction ebooks. When electronic books are so convenient and popular, any author knows digital publishing is not an avenue to be ignored. Amazon KDP direct publishing offers a quick, pain-free and doable way of self publishing your electronic books. Against All Rules is my first book to be enrolled in the process. And I’m going to discuss as briefly as I can the process from writing to publishing. Traditional publishing is thorough and painstaking. Your manuscript is scrutinized and judged before being accepted. You work with an editor. There is copy editing and line editing, so usually you get a few pairs of eyes on your book before it makes to the print. You also need to be as much thorough and pain staking if you’re planning to self publish and if you want your book to shine – if not more! But even after the editing the publishing world moves slowly. And this is where going digital has a big advantage. Once your book is ready, you don’t need to wait for months to get it into your readers’ hands. Let’s discuss what we need to do. Writing is of course is fundamental. But many authors ignore or skip quickly over the second, that is, the editing. Which is where they get hurt. Editing is when your story gets ‘finished’. Just like you cannot wear apparel without tailoring, you cannot publish a book without editing. Not a saleable book anyway. So first make sure that you have a professional editor or at least a good friend with editing experience to go over your book. Editing does not just involve checking your book for typing and spelling errors, language and sentence fixing, though these are of course important. Editing is first going over your story and story scenes. Which scene should be placed where. Whether the setting is working for the scene. How your story is progressing. Are your character motivations right? Your character should not be doing random things because random events do not make a story. So having a good editor to spot those mistakes is a must. Between editing, revising and proofreading do keep on checking every draft yourself. Because the final decision of what your character should be like or where your story should go lies with you. And the next one is a must. Check for proofreading yourself and have a no. of friends read it. The more passes it makes under your eyes and others’ eyes, the better. Ok, I think I have drummed on the editing enough. Let’s move on. Now you have your manuscript ready. You need a cover. For electronic publishing you can learn the skills to design your cover yourself or have a professional designer help you. First of all you need the pictures which should be relevant to the theme of your book. If you’re a good enough photographer, you can shoot the pictures yourself after finding the proper models or setting. Or you can hire a photographer. You can also browse stock photos and purchase them online. It all depends on how much you are willing to invest and how much control you want over the process. Once you have the pics you can make the cover with Adobe photoshop, Adobe Indesign or even in MS word or Powerpoint if you can’t shell out money to buy those softwares. The details of how I did my cover (picture below) are matter for another post but the bottom line is you can do it yourself. Amazon itself offers you a range of basic covers. At a pinch you can go with those even. Though it depends on how good you want your book to look. Remember, some investment on the cover might reap you huge in terms of sales. So do the best cover you possibly can. So now you have your cover. Prepare the front and back pages of your manuscript. You should have the Title page, Copyright declaration, attribution, dedication etc. You can add a Content page with links to your chapters. It’s very easy to do and the instructions are given in the how-to at Amazon. Then in the back pages, you can add your profile and links etc. You can adjust according to your needs. Surprisingly. The easiest part. Truly. Amazon is amazing in that they have made an interface so easy even a relatively technology challenged person like me had no trouble uploading my work. Familiarize yourself with the guidelines and you come to Add new title button. Add your book details, like title, description, categories. Then upload your cover. You’ll have no trouble if you have it in the range. Then upload your file. You can preview your file to make sure it is right in appearance, either via an online previewer or a downloadable file. Once you have previewed, you can click save and continue. On the next page you’re taken to pricing and royalties table. You can set minimum price of your book at $.99. However if you want to take advantage of their offer of 70% royalties (available in certain countries) you have to set min price at $2.99 and make your digital book available through ONLY Amazon, that is their program KDP Select. Now this doesn’t apply to print books. You can sell your print book anywhere but if you enroll your ebook in KDP select it’s locked in for three months and you can’t sell it anywhere else for that time. However, you are given fair warning by Amazon and you have a day’s time to take it off KDP select after you publish. So once you’ve done the above, all you need is to hit ‘save and publish’ easy peasy. Now you’re a published author and your book will be available for buying through online Amazon stores within 24 hours. I hope you found this post useful. If you have any questions, you’re welcome to ask in comments. There’s a lot more you’ll need to know about building your author profile and adding your books to your page. But that’s the matter for another post. 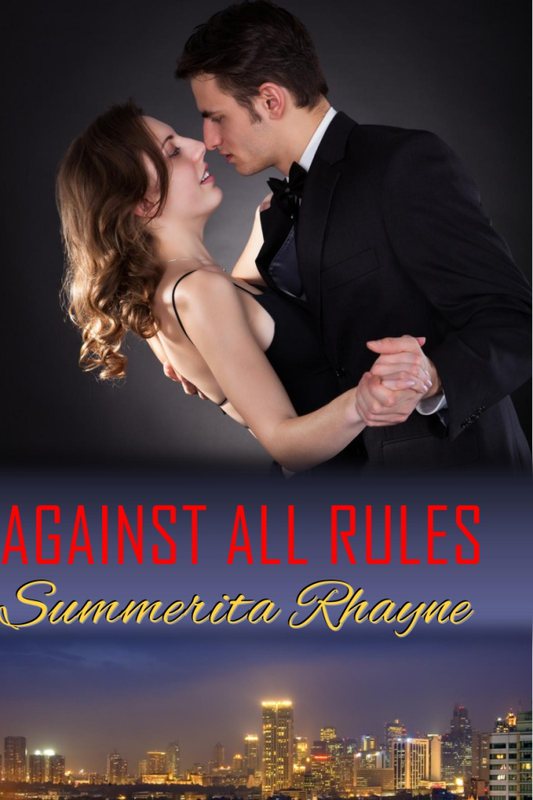 Summerita Rhayne is self published on Amazon with her book Against All Rules out now. She’s currently working on her next book. She loves to write sensual and emotional romance. There’s no knowing when some quirky – or sometimes even not so quirky – happening in daily life might trigger her right brain and then she’s off craving a new story. She loves writing characters who learn and grow and find their way out of their troubles and emotional hang-ups. Hot, sensual heroes and sassy but sweet heroines mostly fit the bill in her stories. She also believes that a touch of humor never goes amiss in a book. She divides her time between family, job and writing – and loves winding down with music, movies and interacting on social media. how billing and other things is done? like bank account and what other things are required? Thanks for hosting me, Cyril. Your bank details and tax related information are taken when you complete your account information on the site. Great post, Summerita, covers all the important basics! Thank Cyril for inviting me to see your site. This is a great post and I hope Summerita is very successful with her new book!